It's OK, lads. You're allowed to like the cute ponies. 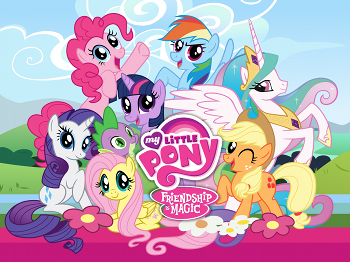 Clockwise from upper-left: Pinkie Pie, Twilight Sparkle, Rainbow Dash, Princess Celestia, Applejack, Fluttershy, Spike, and Rarity. "When I took the job, I braced myself for criticism, expecting many people -- without even watching the show -- to instantly label it girly, stupid, cheap, for babies or an evil corporate commercial. I encourage skeptics like this to watch My Little Pony: Friendship Is Magic with an open mind. If I'm doing my job right, I think you'll be surprised." My Little Pony: Friendship Is Magic is an animated series, part of the long-running My Little Pony franchise, incorporating self-aware humor, a more streamlined art style and strong characterization. It airs on Discovery Family, previously known as The Hub. The show starts with a two-parter, in which main character Twilight Sparkle, an asocial bookworm pony, comes out of her shell and bonds with five other ponies in order to use The Power of Friendship to overcome a prophecy of doom. After saving the world with the magic of friendship, the show takes on an episodic adventure-of-the-week format, where Twilight relays daily reports to her mentor on how friendship helps her and her friends. The first season was helmed by Lauren Faust, a highly accomplished, Emmy Award-nominated animator -- for example, she was the writer and director of The Powerpuff Girls and Foster's Home for Imaginary Friends. Friendship is Magic is her attempt to rescue the genre of girls' cartoons by presenting a clever show with a strong and diverse cast of female characters who aren't pre-occupied with fashion and boys. Her goal was to create an intelligent show for girls that boys and grown-ups could also watch without wanting to shoot themselves. As the substantial Periphery Demographic can attest, she seems to have succeeded. Following the end of the first season, Faust stepped down as the show's executive producer, but she will continue to work with the show as a consulting producer through production of the second season. Not to be confused with My Little Pony: Friendship Gardens, a Gen 2 PC Game. For more, please also visit the episode and character guides. Dear Princess Celestia: Today I learned that teamwork is one of the finest values of friendship, especially when it comes to gathering these tropes.